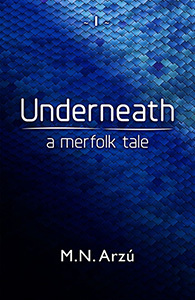 Our friends at Metaphors & Moonlight are giving away two e-copies of Underneath - A Merfolk Tale, the first book in The Under Series. Kristen has plenty of book and game reviews, so make sure to check them out and find more great reads! This week she’s reviewing Undercurrent - A Merfolk Myth, the second book in the series, and you can also dive in to find what she thought of the first book, Underneath - A Merfolk Tale. As part of the Giveaway, comment below about why you love mermaid stories so much, so you can get a better chance at winning your e-book! And if you’re not one of the lucky winners, stay tuned for next week’s promos! Underneath is also free with Amazon Prime all February long, and you can find the three books in the Under Series in Kindle Unlimited. Underneath - A Merfolk Tale is a mermaid story like no other. This deservedly award-winning novel begins as a half-drowned merman with a deep gash in his tail washes up on the coast of Maine. His arrival at the ER leaves his doctors at a loss of how to treat him. Soon, both the military and the United Nations get involved. One reporter is hot on the trail of what she believes is an elaborate hoax—or the story of a lifetime. A story surrounding one of the richest families in New York City. For merfolk have been hiding in plain sight for centuries, and are now torn between sacrificing one of their own—or telling humanity the truth. Can’t wait to get your copy?